Interval training exercises, also known as HIIT, are a great way to combine low intense aerobics with high intense workouts. High intensity inverval workouts really builds endurance and strengthens your muscles. With HIIT, you get the benefit of burning calories and fat in a shorter period. This is due to the inclusion of high intense spurts of aerobic exercises. These spurts really get the oxygen flowing and the blood pumping. If you want to add something new to your aerobic workouts and weekly exercise routine, then keep reading to see if this is what you are looking for. HIIT will give you a great workout, burn maximum calories and fat and get you fit and healthy. High intense interval workouts combines spurts of high intensity aerobics followed by periods of rest or low activity exercise. Basically, HIIT combines the benefits of aerobic exercise and anaerobic exercise. The high intense phase of interval training can be increased speed and/or increased challenge such as walking at an incline. During the spurts of the high intense phase of the workout, you are in an anaerobic exercise state and in this state your body uses the energy stored in the muscles. Anaerobic metabolism works without oxygen. During this time, there is a build up of lactic acid and the body enters an oxygen debt. During the period of rest or low activity, which is the aerobic exercise phase, the heart and lungs work together to pay back the oxygen debt and breaks down the lactic acid. At this time your body uses oxygen to convert stored carbs into energy. HIIT is an excellent way to not only burn calories but to strengthen your heart. The repetitiveness of this type of training helps your muscles build up a tolerance to the build up of lactate and since your heart is a muscle this in turns strengthens your heart.add remaining paragraphs here. One of the best ways to control your HIIT workout is to use a treadmill. This allows you to adjust the speed and incline in order to get to the anaerobic state for the high intense repetitions of your workout. My treadmill comes with exercise routines already programmed in including interval training workouts. So at least once a week I use the preset programs on my treadmill. Elliptical training machines also offer the ability to adjust the resistance, giving you the higher challenge for your workout. 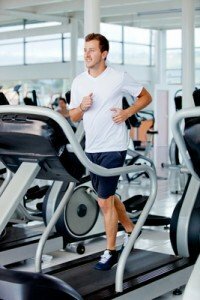 With an elliptical machine, you can increase your speed by just “running” faster and/or increase the resistance. These machines are much easier on the knees. You could also try using a stair stepper machine or use your own stairs in your house. You can also alternate your aerobic phase and anaerobic phase by jogging in place and then jump roping for the high intense phase. Your interval training does not have to include any equipment. You can just use a local track or neighborhood. During the high intense phase, just sprint or run for your set period and then back it down to a brisk walk. Keep in mind that each person's sprint or run will be based on their fitness level. If you are just starting out, don't worry about getting to a full run but instead try a fast jog. As you build endurance you can kick it up a notch. The key thing to this type of training is to include low to medium impact aerobics with higher spurts of energy. So if your higher level isn't the same as the track runner, you will still be building your endurance. The key benefit of HIIT training is building endurance. This is why this type of training is so widely used by elite athletes. Building your endurance will allow you to stay more active at all other exercises and activities. Endurance is not the only benefit of interval training. Other key benefits include increase calorie burn, boosted metabolism, and warding off boredom of the typical exercise routine. With the added spurts of high intense exercising, you achieve higher calorie burn and a significant boost to your metabolism. And with this type of training you are constantly "mixing it up" so you don't get bored. Make your HIIT a personal challenge and aim for increasing the total duration of the exercise routine as well as increasing the duration and instensity of your spurts of high intense exercises. If you are ready to add interval training to your weekly exercise routines, then be sure to check out these example interval training workouts. In addition to building endurance, interval training (like all exercising) has many health benefits. Combine your aerobics and strength training in one workout with these example circuit training workouts. If you are finding it hard to get up off the couch and get moving then check out these motivation tips to get you active.